This release comes with least bells and whistles since we have not added features or changed cosmetics of the software. But still, this is a major upgrade. The change is all internal. WebHarvy has been using Microsoft’s Internet Explorer (IE) as its internal browser since inception. Microsoft stopped supporting IE a few years back when they introduced the Edge browser. So WebHarvy had to switch to another solution to power its internal browser and we believe using Google’s Chrome Browser Project is the way forward. This makes WebHarvy more stable, faster and secure. Switching to Chrome also opens up the possibility of porting the software to other platforms like Mac and Linux. You may download and install the latest version which is based on Chrome browser from the following link. As mentioned before the change from IE to Chrome is internal to the software and transparent to the user interface. So, the configuration process and user interface of WebHarvy remains the same. The ‘Internet Options’ menu option under Edit menu has been removed. 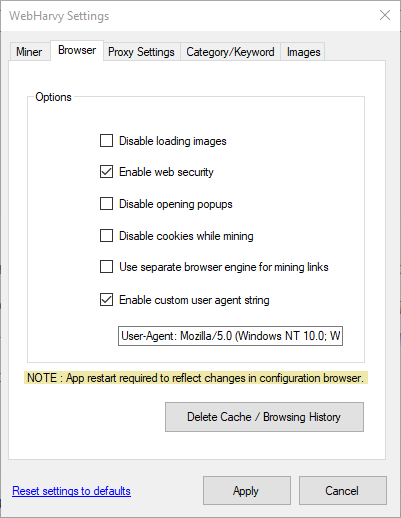 Instead a new Browser options tab has been added in Settings window. Configuration files created using the old version should normally work fine with the new version which is based on Chrome, but there will be exceptions. In such cases we recommend that you create a new configuration using the latest version. This entry was posted in Release update, WebHarvy and tagged chrome browser, Data Extraction, Release, Screen Scraping, web data extraction, Web Scraping, WebHarvy. Bookmark the permalink.